FACT CHECK: Did Maroon 5 Donate Their Super Bowl Halftime Show Earnings to Charity? A charitable donation didn't spare the band from criticism for accommodating the NFL. Maroon 5 donated their entire 2019 Super Bowl halftime show performance earnings to charity. Amid controversy over playing the Super Bowl halftime show, the band Maroon 5, along with their label Interscope Records and the NFL, partnered on a $500,000 donation to the children's charity Big Brothers Big Sisters of America. Super Bowl halftime acts don't receive a fee for performing, so Maroon 5 did not donate their "performance fee." 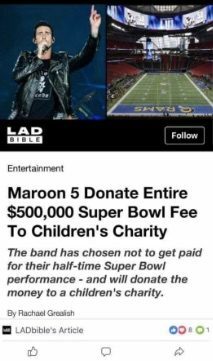 Although it’s true that Maroon 5 partnered with their label Interscope Records and the National Football League (NFL) in making a $500,000 donation to the children’s charity Big Brothers Big Sisters of America, the money didn’t come out of the band’s performance fee. NFL spokesman Brian McCarthy clarified in an email that Super Bowl halftime acts don’t receive performance fees. Maroon 5 followed the lead of rapper Travis Scott, who only agreed to perform at the Super Bowl after the NFL vowed to make a $500,000 donation to Dream Corps, a social justice-oriented non-profit founded by Van Jones in 2015. The large donations to charitable organizations were the result of the mounting pressure the NFL was facing over what critics called the “blacklisting” by the league of former San Francisco 49ers quarterback Colin Kaepernick. Kaepernick hasn’t played since opting out of his contract with the San Francisco 49ers in 2017 and has filed a grievance against the NFL, accusing team owners of colluding in not signing him. Atlanta Journal-Constitution. 14 January 2019. Associated Press. 1 February 2019. ABC News. 1 February 2019. Yahoo Finance. 3 February 2019. The Washington Post. 5 February 2019.